So that's pretty clearly the most awesome jacket ever! Your hair does look all sorts of amazing! Oh how I wish my hair was thicker. Love the look and that lippy is gorgeous. Damn girl you really were having an insanely perfect hair day. Worrrrkkk it! For real! The volume in your hair is unprecedented. LOVE your tassel necklace. I'm so obsessed with tassel jewelry right now. Love this coat - so gorgeous and the boots are amazing! Your hair does look great in these pictures. Cute coat too! Obsessed with that coat. It's gorgeous! Yes. . .you hair is red carpet ready!!! You have insanely good hair. I often think that when I look at your blog. You know I am obsessed with this coat! I'll say you were! These are gorgeous and I love the coat! 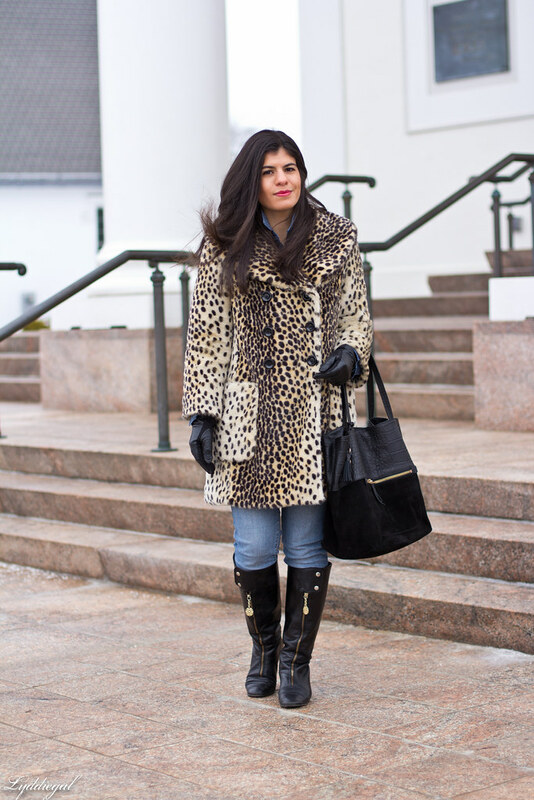 Those boots are fabulous, your leopard coat is gorgeous and I love the dot on dot mix! 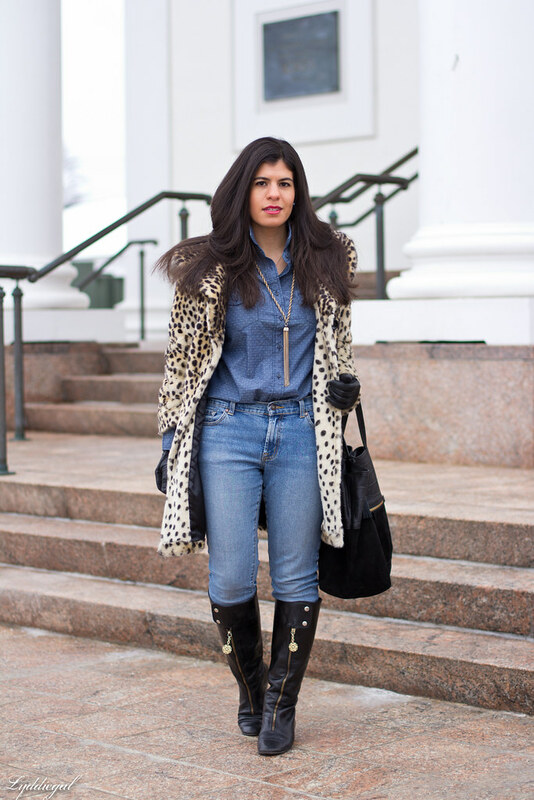 I love your all denim look paired with the leo coat. So chic and confident! Yeah, you do have very enviable hair. I can't grow mine past my shoulders and would need 10 wefts of extensions to get your volume. One of these days I will get a similar coat, it will happen. In the meantime you look stunning. Your hair does look seriously amazing! 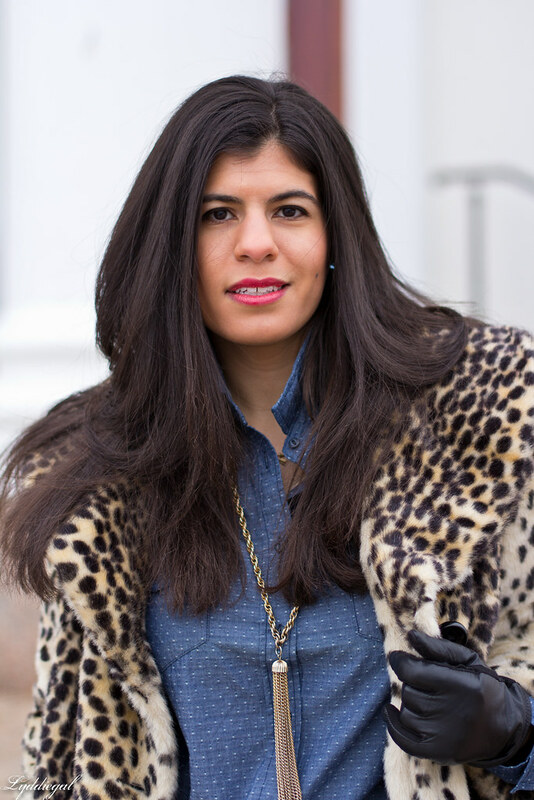 I love how that coat looks with the chambray! Ooh yes your hair does look fab! 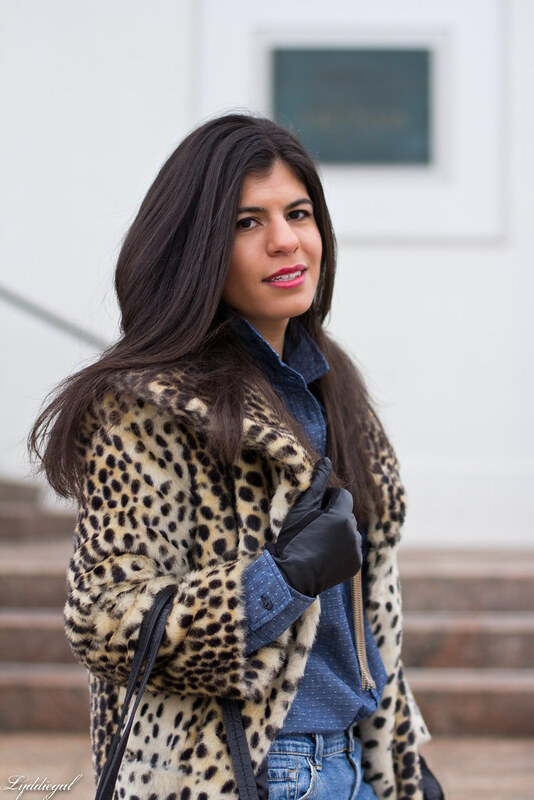 And I love the double denim with the leopard coat--that always adds glam to any look. You hair is beautiful! I'm always so happy when I have good hair on photo day. That coat is amazing and I love your necklace! These are beautiful photos! I love your look. 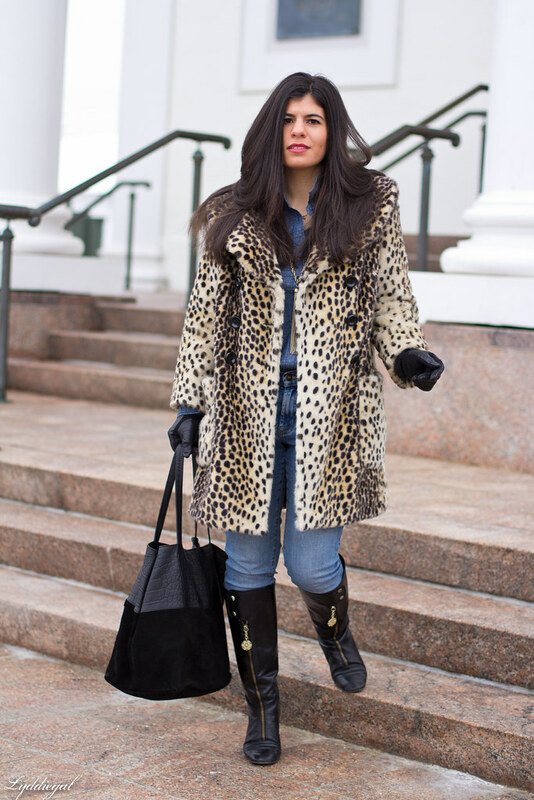 I love the leopard coat and those boots are absolutely amazing! I swoon over that coat every time! Love how you paired it with the polka dots! So cute! STOP IT! I love that coat!! And the boots are so fantastic! Your hair looks beautiful indeed and combination with your gorgeous coat is stunning look. Happy Friday! Your hair does look awesome! :) How do you keep it so healthy when it's so long? I always always try grow mine out by inevitably end up back at the hairdresser getting it cut short as the split ends drive me crazy, ha! I also like to combine denim with denim! Yes your hair looks amazing - but: it always does!!! LOL...your hair does look beautiful but it always is. I love your denim & denim look. Thank you for joining TBT Fashion link up and hope to see you Thursday.